On Sunday we had the absolute pleasure of visiting Luggwoods again for their Easter Train. If you remember we visited at Christmas and it has been our favourite Christmas day out to date. 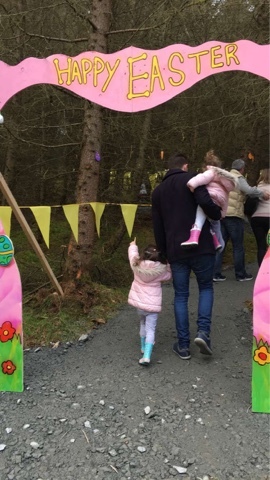 Luggwoods Enchanted Forest is a family run business located just outside of Saggart Village in Co.Dublin about a 30 min drive from the airport! Just like their Christmas train there is face painting before hand! Little whiskers and a bunny nose for all the kids (and adults!) and they also sell bunny ears (2 for €5) all while you wait to board. We were just on time, arriving at 4pm (our train was at 4) which is something I really regret. Couldn’t be helped for us but one huge bit of advise I would give is DO NOT be late and better that come 20 mins early. Get the kids face painted buy the bunny ears and give them a chance to get excited as they wait! We hoped on board at 4pm and there was music and lots of chat from the fantastically enthusiastic girls on the train. We saw a fairy village and spotted letters all laid out throughout the forest!! Noa is just learning letters at the mo and loved this part! All the letters we found spelt “HAPPY EASTER” We hoped off mid-way for an Easter egg hunt! 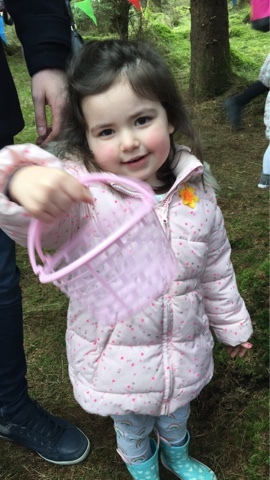 All the little ones were given a basket and they were to fill them with plastic eggs! As soon as the bunting was lifted all the kids made a run for it! 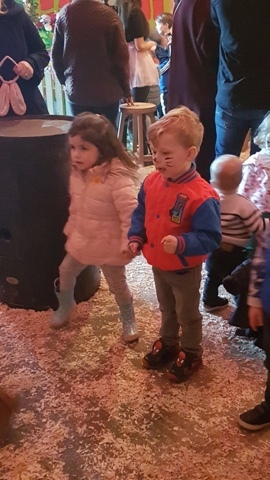 My 8 year old was sorted he was first to get some eggs followed a little slower by my 3 year old who still managed to get some then came my 2 year old who by the time she got over the bumps and dips there were barely any eggs left. Her sister give her a few and she was none the wiser! But, this is where my only criticism lies! I spoke to one of the owners afterwards and had mentioned maybe giving the kids a little more time with the hunt and also letting the little ones go first or in a seperate area. She totally agreed and said going forward they are going to make two trails from where the hunt begins. One up the left and one on the right. Allowing children under 5 to take route and children over 5 take another. That way they will all be able to collect the eggs. Perfect solution and it will take the experience to a 10/10 from me! We hoped back onboard and made our way to Big Red Barn. We saw luggwoods breathtaking view of Dublin which suprisingly for me, looks just as beautiful during the day as it did at night! We arrived to the barn and met some unbelievable characters! A mad hatter and mad he was! He was FANTASTIC. He told the kids a story when we got there, had a tea party and showed the kids some serious moves! Moves that even had some of the parents up dancing! 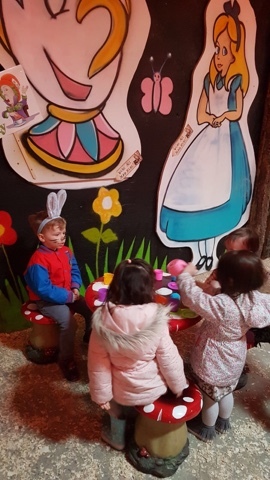 While each family waited to see the Easter bunny the mad hatter entertained the rest and he also gets a 10/10 from me! Dancing, colouring and making the kids laugh. Noa (3) didn’t want to leave she absolutely loved it! 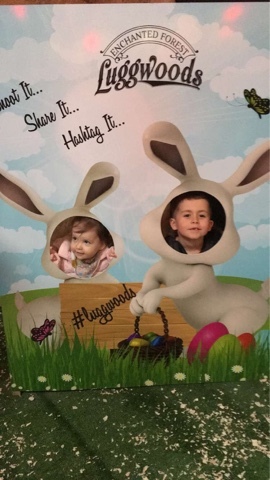 We got to meet the Easter bunny next and got the opportunity to get a family picture! A rarity with 4 little ones! One thing I love about luggwoods is that there is absolutely no rush when getting a picture. The girls are so patient and accommodating. Each child got an Easter egg too! Pictures are available to buy there and then for €10 for 1 or 2 for €15. Refreshments are available at this point too! Had we not been invited along, this day out would have cost the 6 of us €53.96 (including booking) under ones go free! This does not include bunny ears or your picture! So remember to bring cash for that! They do accept cards for the pictures! Was it worth it? 100%. I was an hour an 25 mins and that was jam packed with things for the kids. The were engaged and enjoying it for every second of that! I was sceptical as to how the Easter Train could possibly live up to the Christmas Train we loved so much! I honestly didn’t think it was possible to enjoy it as much as I did the Christmas Train. But I left feeling just as warm inside as I did at Christmas. Totally different experience but still as lovely and warm. Kids loved it just as much! A really fantastic day out with the kids for over the Easter holidays! I highly recommend it! We were kindly invited by luggwoods to hop on board the Easter Train free of charge. As always, all opinions are my own. Last Friday, the kids and I were kindly invited to check out Santa’s Cove (Pirates Cove) in Liffey Valley shopping centre. Christmas is my favourite time of the year. No question. So I was thrilled to go and excited to take the children to see Santa. Santa’s Cove is €12.50 per adult (adults go free at non peak times) €25 per child, Little ones under 12 months are free. Your Santa photo is included. As you all know Milla is 5 weeks old. So I was sure to book the earliest slot available before hand 7.15pm! I also spent about 15mins filling out a form with all the kids details, likes and dislikes. Their hobbies, teachers names etc.. I was happy to fill this all out because I knew the kids would absolutely love this personal touch. Two things that ended up being a complete waste of time. Patting myself on the back (4 kids in tow) I arrived at 6.45pm…. But I was told they were running late and wouldn’t be open until 7.15. Not a big deal I thought as I had my time slot booked already so I wasn’t too bothered. It was their first night so I know there is bound to be a teething problem or two! At 7.15 we all went in to pirates cove.. I say pirates cove because there was no difference at this point between pirates cove and Santa’s cove. There was no Christmas decorations anywhere nor was there any Christmas warm feeling. Actually it was the complete opposite- it was freezing, I actually had to put the kids coats back on in there. They had a play on the bouncy castles which they loved…. But the music was blaring and it was hard for any of them to hear me which was stressful! Then it came time to see Santa and I was more than ready to leave the room and hear myself think again! At this point I realised all the slots were forgotten about and it was a free for all. There was a massive que to go into the experience and there’s me with 3 kids 3 and under including a 5 week old baby, about to wait an hour in a freezing que. I ended up going up to one of the organisers and explaining I had booked the earliest slot and had a newborn with me. She let me skip the que and I was very grateful. To be honest if she hadn’t, I would have just left. Firstly there is a ball pit and a slide to go through to enter the experience. There was a few male elves at the beginning but none of which encouraged the kids where to go or said a word to them actually. Next was a ride on Santa’s sleigh… A very friendly elf helped us on. But Noa (3) had no idea what we were on or why? It would have been nice for there to be a little story from the elf about the sleigh and what they’re about to experience but it was a bit flat. Next we went into a room and the kids made reindeer food got Christmas Eve. 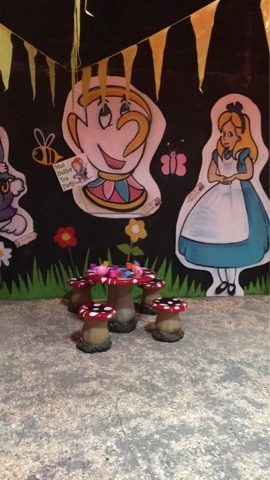 The kids really enjoyed this part… The elves were great with them and the loved to hear the story. I’ve heard from friends these elves lost their mojo by the end so bear in mind we were first in… The boxes were awful that the food is kept in and noas spilled everywhere! Next they got to make decorations which again they loved… This male elf was amazing with the kids… Didn’t rush them at all! Next was a stop for hot chocolate and mince pies with a woman I can only assume was Mrs.Claus because she didn’t say much and didn’t interact at all with the kids. She actually looked quite grumpy in my opinion. Bear in mind again, we were one of the first in!! The naught or nice machine. I got this… I like the concept but the machines were extremely loud and way too long. I think the naughty or nice “deliberation” needs to be cut in half. And most disappointing was they all got a “nice certificate” but there names weren’t on it?!! The name part was blank! Next was the last stop… Santa..
Our Santa had a real beard which I think is extremely important. But for me he wasn’t warm or welcoming and the whole form I spent 15 mins filling out the night before was no where to be seen. I had to prompt Santa with everything. The picture was very rushed and to be honest I felt anxious leaving. When the picture was printed it looked like it had been taken on a phone and not one of my kids were near Santa. We hadn’t been helped or given a second to position the kids for a lovely pic. For me the picture is always my highlight! For me the experience wasn’t very warm. It wasn’t very Christmassy and none of the staff were very enthusiastic. Most of the elves were great but for me the most important is Mrs Claus and Santa. And both were very flat in my opinion. Is it worth the €125 it would have cost for my family of 6. €125 is a lot of money for my family. It is money I want to spend on an experience that will stay in my kids memory’s for years. One that my kids will say “remember we went to…” An experience you leave feel warm and happy and for me this isn’t Santa’s Cove. Unfortunately I left Santa’s cove feeling stressed and cold. It seems to me the organisers have put in the work and gotten all the big bits… But have forgotten it’s all the little bits that make it magical! We were kindly invited to a press preview of Santa’s Cove in Liffey Valley free of charge. But as always all thoughts and opinions are my own. Fourth baby and first time to have a baby moon. And let me tell you I was seriously missing out! My husband and I had the pleasure of staying in Farnham Estate & Spa last month and I had the pleasure of experiencing the most amazing facial in their gorgeous Spa. Farnham is stunning to stay over night, but I also think if that wasn’t possible it is perfect to go for the day have some afternoon tea, pregnancy treatments, a swim and a gorgeous dinner! Farnham offers so much more than just a night away! It would also be a fantastic venue for a baby shower! Our Room- Neil and I had the pleasure of staying in the Deer Park Suite. When we first walked in we couldn’t believe it. It is fab!! Two huge windows open the room up to those stunning views and in the room is a huge four-poster bed. Arm chairs and a TV and a nespresso machine (fantastic little extra in my opinion) and then the best bit.. a HUGE bathroom. Again, two huge windows letting relaxation flood in. A bath in the middle of the room with a view directly out the window. A double sink and a huge double shower. Such a luxury and so perfect for a very deserving mum to be!! Pregnancy Espa Facial- On my last three pregnancies I never had the opportunity or the finances for a pregnancy treatment. Or so I thought! I also always thought with not being able to lie directly on my back or front I felt the therapist would be limited in what they could do. Again, wrong! I was booked in for an hour long facial and head massage with Espa products in the Spa. I arrived a little early to fill out my form, a little about my health and preferences re massage etc. I was then lead to a quiet and calm corridor and lead to the changing rooms. Clean, quiet and a locker provided you need a euro for the locker as members of the gym also use the changing rooms so don’t forget that!! Bernie, my therapist then showed me to my room. As I mentioned, not having a pregnancy treatment before I didn’t know what to expect. Bernie was really amazing she explained everything to me- what she would do, what I should wear and how I should position myself on the bed. She let me try and smell all the products she would be using on my face and let me choose which ones I preferred. For me this was unbelievable, being pregnant some smells are just not very appealing to me so I really appreciated this little extra. Bernie also asked me loads about my skin and I really felt she got a good understanding about what way my skin has been behaving through this pregnancy. It made me feel very relaxed and calm before the facial had even begun! The bed when I lay on it was warm which was perfect and with the soothing music playing in the back round I was already in heaven. The facial and head massage itself was just heaven. So relaxing and my skin reacted so well to all the products Bernie had used. Shows just how much she had really listened when I told her about my skin. I cannot recommend Bernie enough, I had ticked medium pressure on my form and she was perfect. She made me feel so relaxed and so comfortable that I didn’t want it to end! Afterwards she lead me to a small relaxation room and a glass of water. I was floating. I then met up with Neil for a swim in the beautiful pool. Surrounded by stunning views the pool is incredible. They also have an infinity pool and I have say it is breath taking! I really felt like a pinch me moment relaxing in the infinity pool. It is nothing like I have ever been in before. I had always thought through my previous pregnancies and this one that pregnancy treatments didnt have much to offer. And they weren’t worth the money. I can honestly say I was so wrong. A pregnancy treatment and babymoon is essential for any mum to be. Even if you were to put away a little bit each week from the beginning of your pregnancy and cash it in at the end when you have all the aches and pains and really need it! I would advise any expectant mum to choose Farnaham for your babymoon and if you do, I highly recommend getting a pregnancy treatment from the talented Bernie, you can thank me later! To discover what it is that you will take away from Farnham Estate, packages begin from €159 per room midweek bed and breakfast. For further details and to book treatments, consultations and packages in the Health Spa please contact the spa on 049 437 7700 or email healthspa@farnhamestate.com. Visit www.farnhamestate.com for further information on special offers. We had the pleasure of hopping on board Rathwoods famous woodland train last week. We went for a teddy bears picnic and a search for baby bear. Rathwood started train journeys 10 years ago and since Kyle was small I have been dying to try it out. And it did not disappoint! All children got name tags which was lovely so all staff could call them by their names! Making our 2 year old Noa feel very special! They got a teddy at the beginning which they got to stuff themselves and carry on board for their train ride, again such a lovely touch in my opinion! There are lots of interacting with all carriages of the train throughout which I loved. Songs and different things for the kids to see and shout which was lots of fun. We picked Mommy, Daddy and baby bear up on the way.. And they even hopped on board! We stopped off an fed the ducks and all children got some bread to do so which was lovely! And then at the end when everyone got off the children got a little picnic which had a drink an apple and a cookie. Both our kids were thrilled with this! They had picnic blankets for everyone to sit on but unfortunately not enough for us..and about 4 other families! The grass we sat on was a little damp which I found a little disappointing, I think it would be worth Rathwoods while to invest in a few more picnic blankets and have enough for every family on board! The kids all got a chance to have a picture with the teddy bears which Noa loved.. Kyle 7 was not as keen! I think over all Noa 2 1/2 loved every minute me for Kyle he was just a little old but he really did enjoy his day! The kids got vouchers for a free ice cream so we headed to the cafe and the fantastic playground the have right beside it! In my opinion the price for the food does not match the quality. All that was available for the kids was frozen/fried options. I would have loved to see some fresh sandwhiches and fruit for the kids.. I thought the food for the adults was a little expensive too so my advice would be to bring a picnic and around the back of rathwood are beautiful walks and lots of picnic areas! It is advertised to be a 60 min experience which even after pics with the bears etc only lasted 50 mins… I would love another lap or a little longer route on the train. For the 1 hour and 30 min drive from Dublin the whole train ride was over very quickly. BUT both my kids really enjoyed the day! What a lovely day to bring grandparents along to too? There is a calm feel about rathwood and I know my MIL and FIL would love it and also a look in Rathwoods stunning garden centre!! Tickets are €7 per child and €4 per adult which in my opinion is totally worth it! And we really look forward to going back! For more trains, times and info check out their website. We received our tickets complimentary in return for an honest review.